Palm Springs nearby Mount San Jacinto received an early dusting of snow this Wednesday as a brief low-pressure weather system moved down the West Coast, dragging cold air down from our Canadian neighbors to the North. The cold air dropped our desert temps into the 70’s for one brief day, which was about 15 to 20 degrees below normal. Palm Springs area temps get back to normal today with a sunny high of 81 (27.2º C) predicted. 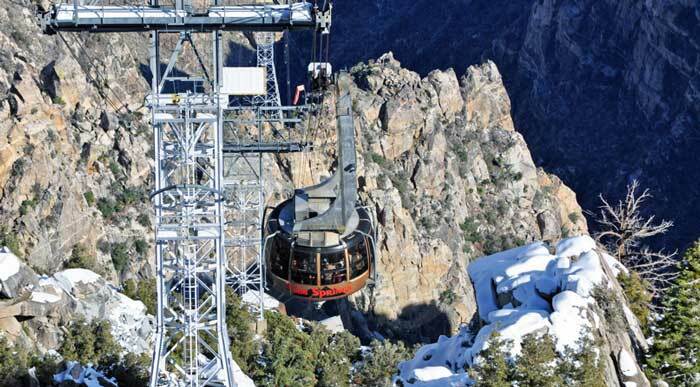 Visitors to the Palm Springs Arial Tram were surprised to see snowflakes falling as they exited the tram at the top of Mount San Jacinto as the snow line fell as low as 5,550 feet elevation. This brief storm brought a soft rain to parts of Palm Springs in the eastern end of the Coachella Valley yesterday, but here at our offices in the City of La Quinta we didn’t see a drop. If you’ve never experienced the Palm Springs Aerial Tramway you’re missing out on a great ride. The ten-minute ride begins at the Valley Station – elevation 2,643 ft. and ends up top at the Mountain Station – elevation 8,516 ft. The last time I road the tram was prior to the 2000 installation of new tramcars–now the world’s largest rotating tramcars. The ride up is spectacular and the change in weather is pretty stunning, often 30 to 40 degrees cooler than the desert floor below. Snowbirds missing the white stuff back home can often go up the mountain and get reacquainted. And no, you won’t find any Palm Springs area homes or luxury condos atop Mount San Jacinto, but you can experience the valley’s highest elevation restaurant! You can read about the history of the tram on the official Palm Springs Aerial Tramway Website which also offers information on hiking, dining and other activities.